Last week a friend, Loris Bogue, and I attended a workshop with Valerie Goodwin at Art Quilt Tahoe. Valerie is a professor of architecture at a university in Florida with a very busy schedule, so we were very fortunate that she was able to come to the west coast. 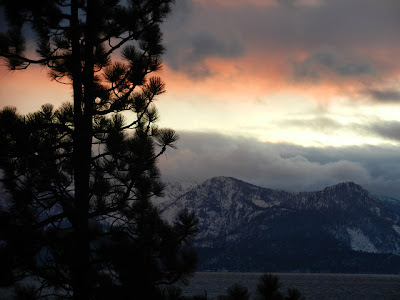 Art Quilt Tahoe takes place at a beautiful setting, Zephyr Point, not far from my home. Here's a shot of the alpine glow you can see after sunset. Unfortunately it was quite cold at the beginning of the session, but as the week went on, it started to warm up. We did many exercises in line and composition and then went onto begin our personal projects. The exercises were very helpful. 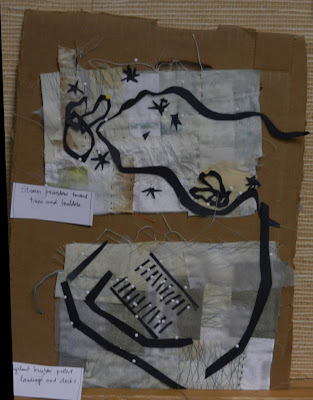 I find in art classes, I learn more from the critiques, and it was certainly the case in Valerie's class. Most students chose a city map of various cities throughout the world. 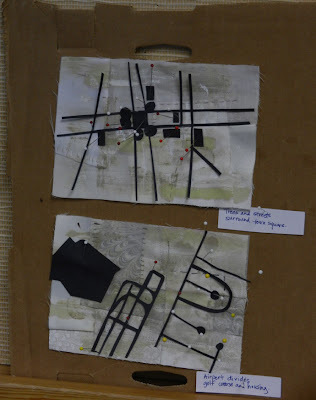 Some students chose to do almost imaginary maps which became very interesting, almost abstract. I chose to use topo and geological maps and an image of an area here in Tahoe--Mt. Tallac. Here is the piece so far. The background (sky) are the types of rock formations in the area. I hope to do some surface design on it to integrate it more, then will stitch the topo lines and streams in different threads. 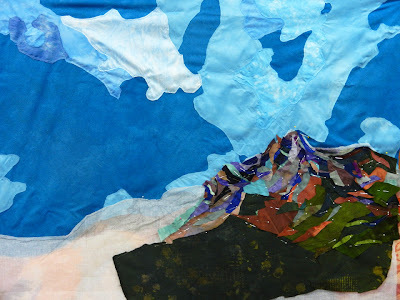 The middle ground is an image of the mountain--I am using tiny pieces of fabric and will stitch it down with black or violet tule. The foreground are the trees and valley, which may be painted or printed and modified. I'm not sure yet. It was a wonderful experience. I am looking forward to taking Valerie's 5 day workshop in composition. I learned so much in such a short amount of time. But what I think was the most valuable was the opportunity to slightly see the world through Valerie's eyes. It really opened areas for me to explore.